Process Tour | DIX Metals, Inc.
Want to see how Dix Metals works? Take our quick interactive tour and follow a day in the life of a job at Dix Metals. One item unique to Dix Metals is a job-tracking sheet called a “job traveler.” It moves along with the job as it progresses through the facility and maintains a record of every step. Data collection stations at each work area gather information on what was performed. Orders are received from customers via phone, fax, e-mail or Internet. The customer’s purchase order specifications are reviewed by a dedicated sales consultant, and checked for clarity and feasibility. It is important to clearly define customer expectations at this point to be sure promises are delivered. DIX Metals prides itself on providing a superior level of customer service. Not just at certain steps in the process, but throughout the handling of every job. Attention to customer satisfaction begins here, and never lets up. Most quotes are completed within hours. Once the material and process requirements have been established, a sales order is generated and sent to Job Planning. Job Planning reviews material requirements and builds a ‘job traveler.’ This begins with a standardized process that is then fine-tuned to each specific job. The job traveler is a set of documentation and instructions that follows an order from inception to completion of the job, and defines the most efficient processes (sawing, grinding or milling) to be used in meeting the customer’s specifications. Once this job traveler is built, materials are issued from inventory and released into production to the appropriate work-center (sawing, grinding or milling). Whenever a team member touches a job, they log into a data-collection workstation and record the work performed on that job. The materials for a job are pulled and verified before being released into production. Technicians make sure that the materials used are free of defects and anomalies. DIX Metals stocks a wide range of aluminum plate and bar products. Whether customers need tool steel, stainless steel plate, aluminum plate or something more exotic for their metal blanks, they'll find what they’re looking for. And if, by chance, something is not in stock, odds are good it can be obtained fast. DIX Metals has established strategic relationships with mill source suppliers. As part of an ongoing planning strategy, materials are purchase in large volumes to gain competitive pricing. This process guarantees inventory reserves of critical sizes over the course of inventory turn cycles. Savings are then passed on to customers. This process further ensures that DIX Metals will always be a cost-effective resource. Once the job is released into production, DIX Metals’ team of professionals follows a specific sequence of production steps as defined by Job Planning in the job traveler. There are many quality checks that occur during the production process at critical milestones to ensure work is being performed within tolerances. While some jobs may only require one or two production processes, 75 percent of process orders use all three, adding tighter tolerance at every step. Every job starts with an open tolerance. Sawing trims raw stock material down to workable pieces. While not the most refined method of sizing material, it is generally the quickest and least wasteful. Heat/lot numbers are also verified when the material is cut, to ensure the correct material is being used. Waterjet is the fastest growing machine tool process in the world. It cuts without heat and leaves a clean edge, eliminating the need for secondary finishing. It works by pressurizing water up to 60,000 psi, and forcing it through a tiny opening Waterjets are capable of cutting a variety of materials with CNC accuracy. Typical part tolerances range from between 0.003 and 0.005 of an inch. When small amounts of abrasive particles, such as garnet, are mixed into the jet stream, the resulting "abrasive waterjet" can cut virtually any hard material such as metal, composites, stone and glass. Waterjet cutting systems are the world's most versatile machine tools. They are capable of cutting virtually any shape in a single step with edge quality that usually requires no secondary finishing. They're the most productive solution for cutting a wide range of materials from 1/16 inch to more than eight inches thick. During the grinding process, the thickness tolerance is addressed to a specific dimension as defined in the Job Traveler. Material is removed evenly from the surface using abrasive discs to create a flat, even plane. DIX employs two primary forms of grinding: double disc and blanchard.Blanchard grinders remove material from one surface at a time, while double disc grinders simultaneously work opposing sides. Typically, parts too large for double disc grinders are Blanchard ground. Often referred to as rotary disc grinding, Blanchard grinding is used when a substantial amount of material has to be removed. Blanchard grinding also proves to be a more cost-effective solution. DIX Metals uses blanchard grinding machines for standard surface grinding of large and small plates, washers and rings, and more. The main feature of our blanchard grinding operations is heavy stock removal rates for all magnetic materials. Non-ferrous parts are handled at slightly lower production rates due to the holding requirements. Blanchard grinding is best suited for single-sided material removal and grinding applications too large for double-disc grinding. When a substantial amount of material has to be removed, blanchard grinding proves to be the more cost-effective solution. Dimensional tolerances to ±.001", parallelism to .001", and flatness to .001" are achievable with blanchard grinding. After the thickness tolerance has been addressed, and using that datum as a base to work from, width and length tolerances can be addressed. The resulting piece will have six flat, square and parallel sides. Twin mills are ideal for this step because their opposing shell-mills address two parallel sides of the material simultaneously on each plane, guaranteeing results according to specification within .001. This is most often the final step in addressing a surface. If customers require a special final finish, this is usually done here. If there is no further surface improvement required, the job is sent on to Quality Assurance. DIX Metals offers flattening services for stock aluminum plate up to 1 inch in thickness. When metal comes from the manufacturer or customers, there can be distortions in the metal. Most are barely visible to the naked eye. DIX Metals’ experts can spot these defects and use a variety of presses and other devices to true the metal up before or after the blanks are ground. It takes a keen eye and a subtle touch to move the metal in just the right way to get the proper result. Surface improvement equipment puts a very fine finish on most materials, depending on the needs of the customer. DIX Metals uses timesavers to apply a brush finish, achieving surfaces as smooth as 16Ra. Once production is complete, the job is sent to final inspection, where several samples are pulled from the job (unless the total quantity is small enough to permit inspection of each one) and closely scrutinized. Sensitive instruments are used to test the pieces for a match against the specifications in the Job Traveler. Once the audit process is complete, the quality assurance team builds a QA document package that includes material certifications and certificates of conformance. These documents are scanned from mill test reports that verify each step of the production process. Once a job is released from QA, DIX Metals’ shipping team audits the document package, verifies quantities and notes any special packaging requirements. For example, many parts are vacuum-sealed to prevent damage during shipping. Finished materials are then packaged and staged for shipping using carriers that deliver on time-definite schedules. Orders can be delivered faster than most people realize. 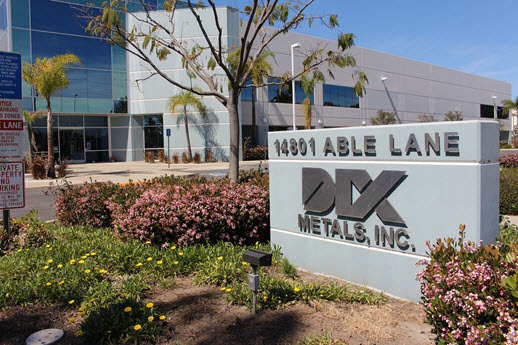 Though DIX Metals is located on the west coast, its proximity to several major shipping hubs puts nearly every address in the country within easy reach.